BMX stands for Bicycle Moto Cross. Who competes in a BMX race and who controls the sport? BMX racing offers an activity to all those who want a sport which is full of thrills and action, is exciting but retains a disciplined atmosphere. Above all BMX racing is a family sport that all ages can take part if they wish, as there is an age group for all. Rules and regulations of the BC - BMX govern a facility to race on properly constructed tracks, in an off-road environment with lots of fun. The sport of BMX racing has earned its recognition so much that the British Cycling (BC) realising the potential the sport has to offer cyclists. Most significantly enabling access to funding through the relevant sports councils and affiliation the Union Cyclist International (UCI). The BMX track must adhere to the minimum requirements of the BCF BMX and UCI regulations and be of a high standard to host a national event than to run a regional or open event. 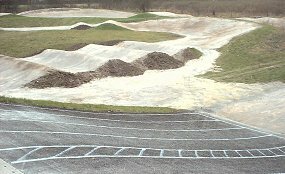 The average BMX track will be between 300 / 400 metres long. However we now realise that there is a need to look at providing a smaller scale track called Intermediate tracks to cater for the small pockets of land available in our towns, cities and villages. These Intermediate tracks will provide a cycling facility much cheaper to build and to maintain, aimed at the beginners or the casual use riders who like to ride but not seriously. In considering the construction of a BMX race track, it must be realised what is being catered for. BMX is a fast and exciting sport for all, with an element of perceived danger. By adhering to strict safety procedures especially with the design of the track the sport is able to maintain an excellent safety record. BMX racing has participants from 5 and under to 50+ at all levels of skill and therefore a track should be designed to be challenging yet safe for all. Most tracks are affiliated to the BC and have a group of people to look after them. This group form a committee usually consisting of a Chairman, vice-chairman, secretary and treasurer etc. All BC clubs have a constitution (set of rules) by which they run their club. The BC have a draft one that you could use as a guide to help you set up your own. The committee are responsible for the running of the club and will decide how the club is run, organise club nights, social events, fund raising, keeping you informed about racing events that take place through out the region and in fact the country. Safety through out is of the utmost importance. All participating riders must wear suitable clothing, a helmet, full finger gloves, long sleeved top and trousers. There should also be padding on the crossbar, handlebar stem and handle bar cross piece. The bike should be of sound construction with no dangerous protrusions.